Welcome to the Eye on BC’s Forests winter newsletter. This is our first issue of 2019 and I am looking forward to a great year ahead. Over the next six months, one of the Board’s top priorities is updating our strategic plan. Ultimately, we will establish the priorities for special projects the board will focus on in the next three years. As part of this process, we will be reviewing our mission, purpose and our values and guiding principles to ensure that they remain relevant. 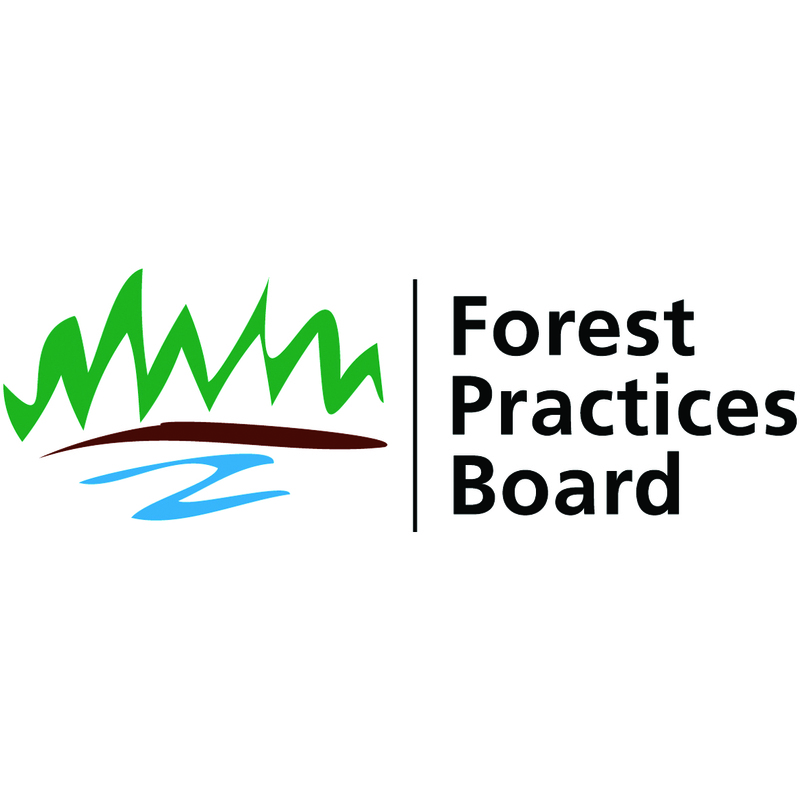 The Forest Practices Board is known as “BC’s public watchdog for sound forest and range practices.” We have legislation that establishes our mandate, including requirements to undertake audits, respond to public complaints, investigate compliance of forest and range practices and the appropriateness of government enforcement, appeal certain enforcement decisions, and prepare special reports. But just as important as what we do, is how we do it. 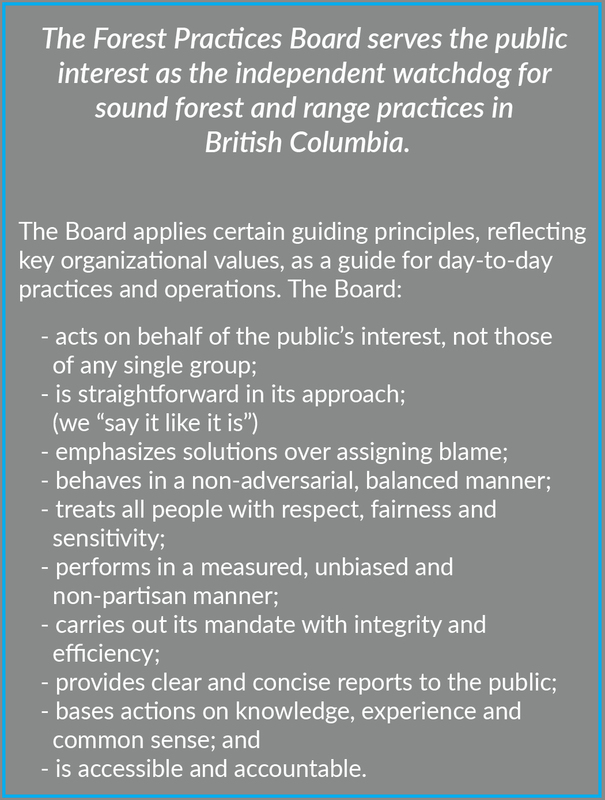 The Board has 10 values and guiding principles that were adopted in 1995, and guide how the Board operates (see sidebar). The Values and Guiding Principles ensure that our Board members and staff share a common understanding of the way we will do our work. Every time the board initiates a project, talks to a client, or issues a report, we look to the values and guiding principles to ensure we are operating in a manner that is consistent with those values. We are interested in your thoughts on our mission and our values and guiding principles. Are they still relevant and appropriate in today’s environment? Or do they need updating? Tell us what you think…email us your thoughts at FPBoard@bcfpb.ca. I have been actively getting out and meeting with people around the province. Board staff and I will also be speaking at, or attending, a number of upcoming conferences and annual general meetings. Look for us at these events and please come over and talk to us. If you would like to book a meeting with us for your organization, please contact our office at 250-213-4700 or at the email above. Staff in the Ministry of Forests, Lands, Natural Resources Operations and Rural Development (FLNRORD) are working on amendments to the Forest and Range Practices Act (FRPA) that are expected to be introduced into the legislature in 2019. We are told that some of the changes being considered are based on work the Board has done, including our 2017 Special Report on Opportunities to Improve FRPA and our work on range planning and practices. It’s been 15 years since FRPA was introduced, without any substantive changes made to the legislation in that time. We are looking forward to seeing improvements based on the experience and knowledge we have all gained since 2004. On October 4, 2018, the Forest Appeals Commission (FAC) delivered its decision on an appeal by the Board. The appeal involved determinations related to a 90-hectare forest fire near Vanderhoof in 2014, caused by forestry operations. Under the Wildfire Regulation, forestry activities should have been shut down at the time of the fire. However, the parties involved mistakenly relied on information from the wrong weather station. The decision maker accepted the defence of “mistake of fact,” based on reliance on the wrong weather station. The Board appealed on the grounds that the mistake of fact defence should not have been accepted. The “mistake of fact” defence requires reasonable care to ascertain the true facts. It’s not enough to be honestly mistaken about the representative weather station. The major licensee in this case did not exercise reasonable care. Since the major licensee was acting as agent for the TSL holder, the TSL holder is not entitled to the defence. However, the contractor was in a different relationship to the major licensee, and it took reasonable care to ascertain the facts, so is entitled to the mistake of fact defence. This is a successful outcome that properly limits the availability of the mistake of fact defence in situations where a major licensee effectively controls the TSL operations. It should help future decision makers facing similar situations. The decision also establishes a bar for the considerations that should be made when determining which weather station is representative (e.g., proximity, biogeoclimatic subzone, elevation, geography, topography, and local knowledge). Government has responded to the Board’s report on its review of FREP and has committed to making improvements to the program in line with the Board’s recommendations, including developing a new 3-year strategic plan and a licensee engagement strategy. We are satisfied that government is taking action to address the recommendations made by the Board in this report. We have encouraged the ministry to make this work a priority and to implement it as quickly as possible. We will continue to highlight this report to encourage continuous improvement and we are considering a range of avenues for the Board to maintain a high degree of focus on improved monitoring of forest and range practices. The full response from the ministry is available on our website. Partly in response to a recommendation made by the Board in its report, Special Investigation of Community Watersheds: From Objectives to Results on the Ground, (April 2014) the ABCFP and EGBC released draft professional practice guidelines—Watershed Assessment and Management of Hydrologic and Geomorphic Risk in the Forest Sector—for a member review in December 2018. The guidelines were prepared by a team comprising members of ABCFP and EGBC. The College of Applied Biology (CAB) contributed to the development of the guidelines by reviewing and commenting on the content of the document. Comments received from the Member Review will inform the final draft of the guidance. Once the reviews are complete the guidance will be presented to the Councils of the ABCFP and EGBC for approval. The Board is pleased to see this guidance piece coming to fruition – it should help forest professionals to determine the appropriate content of a watershed or hydrological assessment when working in a community watershed. Government has responded to the Board’s complaint investigation report and recommendations for addressing rare and endangered plant communities in the Sunshine Coast TSA. The Board is pleased that government has committed to undertake further analysis and inventories to address risks to rare plant communities, assess the need to update the CDC database based on the outcome of this initiative, and review the current wildlife tree retention area guidance to help maintain larger representative components of higher quality rare plant communities. The Board will follow government’s progress with these initiatives and report to the public as appropriate. The Board has about a dozen complaints currently under investigation. Two of them are highlighted here. We are currently investigating a complaint about the Shovel Lake fire. It was the 5th largest fire in 2018 and burned over 92 000 hectares of forest. The complainant asserts that widespread logging debris and slash piles contributed to the spread of this fire and that licensees did not comply with the requirements of the Wildfire Act. The investigation is ongoing and a report is expected in the first half of 2019. There have been a number of news stories recently about logging of large old trees in the Nahmint Valley near Port Alberni on Vancouver Island. 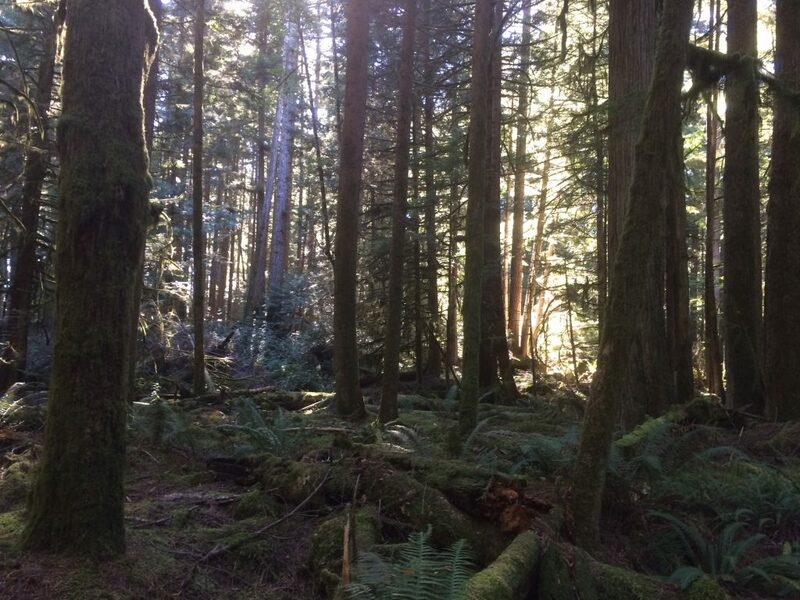 The Ancient Forest Alliance has filed a complaint with the Board about both the BCTS logging and the government’s investigation of their concerns. 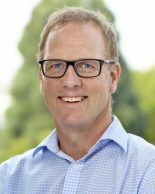 The Board is looking into the complaint and will report out on whether BCTS complied with the Vancouver Island Land Use Plan and the organization‘s own policy for retaining large trees, and on the appropriateness of government’s enforcement in response to the Alliance’s complaint to the ministry. During 2018, the Board received 58 concerns from the public. These concerns are dealt with by Board staff and may or may not end up as a formal complaint. In most cases they do not. The following is one example of how we try to resolve concerns before they become complaints. In Spring 2018, a portion of the City of Grand Forks flooded, as did rural floodplain areas adjacent to the Kettle and Granby Rivers. Recovery operations in the Boundary are being led by the Kettle River Watershed Authority (KWRA) in partnership with the City of Grand Forks. This summer, Board staff were invited to talk to the KRWA about the Board’s work, what we have seen in watershed management and some of the tools that could be considered to understand possible connections between harvesting and flooding. About 40 people attended. We also received two separate concerns alleging that harvesting had contributed to the flooding situation. 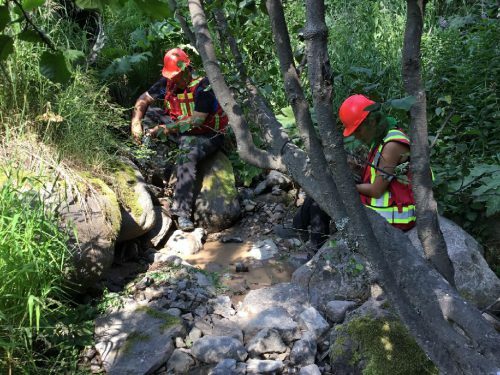 To deal with those concerns, we encouraged BCTS and Interfor to get ahead of the curve by implementing tools to provide an assessment of hydrologic risk across the Boundary watershed (these tools have been implemented in several timber supply areas, including Kamloops). The local forest licensees have since met with FLNRORD and together they have agreed to conduct a TSA-wide cumulative effects assessment. This should be a good way to understand the base case in the Boundary and specific sub-basins that might be exhibiting significant hydrologic risk. This information can inform future forest development in the Boundary. Over this past summer, Board staff completed fieldwork on three special investigations. 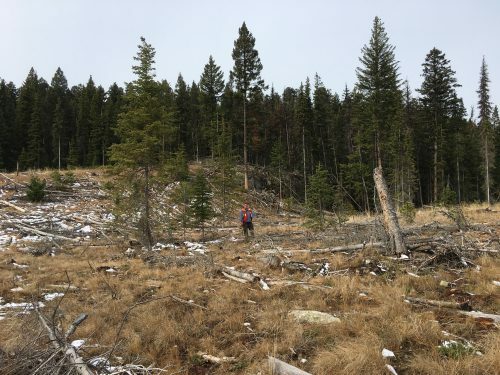 In the summer of 2018, a team of investigators visited five watersheds across BC to assess forest and range licensees’ planning and on-the-ground practices to conserve fish habitats. The team, which included two fisheries biologists and a hydrologist, assessed compliance with FRPA’s requirements as well as evaluating the condition of stream channels and fish habitats. Investigators walked up and down road banks to inspect crossing structures and along stream channels to assess habitat conditions. A report on the findings will be published in 2019. Are Appropriate Reforestation Choices being made in the Interior Douglas-fir Biogeoclimatic Zone? Another team of investigators, consisting of four forest professionals, completed field work for our special investigation of reforestation in the Interior Douglas-fir biogeoclimatic zone. They looked at compliance with FRPA requirements for reforestation and the effectiveness of reforestation choices in achieving long-term timber and forest resource objectives. Investigators interviewed government, licensee and BCTS silviculture staff in four natural resource districts, where they also assessed the planning and silviculture practices of 25 licensees on 76 cutblocks. In the field investigators reviewed species choices for reforestation and their consistency with ministry directives and the efficacy of silviculture treatments. The results are now being analyzed and a report will be published in 2019. A third team of investigators was out on the ground examining field sites for this special investigation. Staff looked at regulated practices under FRPA, voluntary practices by licensees, and success of both regulated and voluntary measures in retaining habitat and functioning breeding territories. The review was completed primarily through interviews and field site visits. Staff visited 43 sites with 50 nests observed, in nine areas of the province. More than 37 professionals have been interviewed, including foresters and biologists from government ministries, forest licensees, BC Timber Sales in 5 regions, and several consulting biologists. The results are now being analyzed. Ken Higginbotham completed his term as a part-time Board Member at the end of August 2018. Ken joined the Board in 2016 and brought his thoughtful and practical views to many Board discussions. Ken paid particularly close attention to safety, as he was also Chair of the BC Forest Safety Council for much of his time with the Board. His calm, reasoned and pragmatic approach to all issues was very much appreciated by the Board. We thank him for his service to the public and wish him all the best as he transitions to full retirement. The Board employed two co-op students over the spring and summer terms. Both students got some great hands on experience and made significant contributions to the Board as part of their co-op placements. 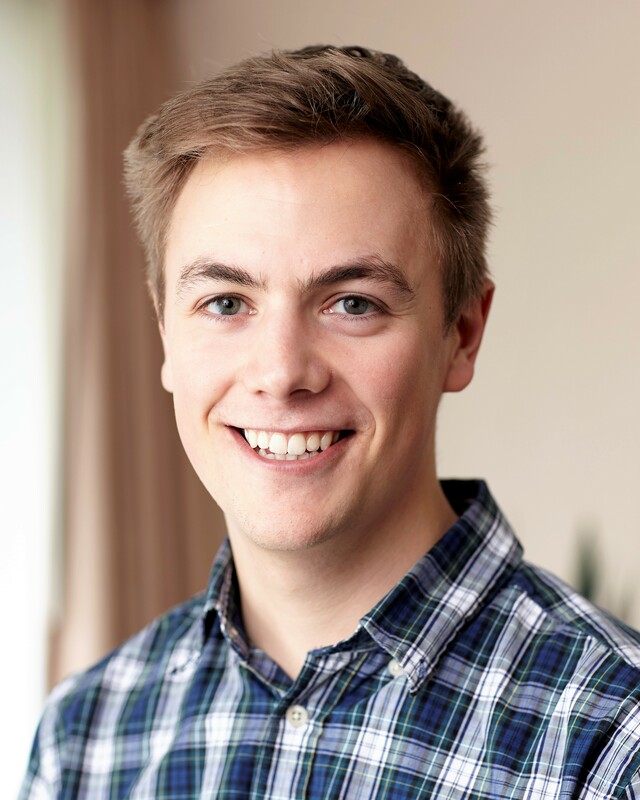 Andrew spent much of his co-op term working on the publication and communication of Board reports and findings, developing his writing skills and doing some hands on website and social media work. Andrew’s major at school is ‘human dimensions of climate change’ and he assisted the Board in developing and giving a presentation to the Federal Senate Committee on Climate Change and Forestry when it stopped in Vancouver as part of a cross-Canada consultation process over the summer. Georgina spent her co-op term in the Investigations program where she worked with Board investigators. She helped with complaint interviews, data collection and analysis, and she was part of the special investigation teams examining reforestation in the IDF and fish habitat. Georgina was able to view real forest practice issues on the ground and think about how to address them in the real world and not just theoretical classroom-based analysis. The Board officially welcomed two new staff in November, filling vacancies left through retirements. We are very pleased to welcome Astrid and Tom to the team. Tom officially joined the Board staff in November in the Audit program. Tom has a Tech Diploma from BCIT, a Bachelor of Science in Forestry from the University of New Brunswick and a Master of Forestry from the University of British Columbia. He is a Registered Professional Forester (RPF) and a Geoscientist in Training with EGBC. 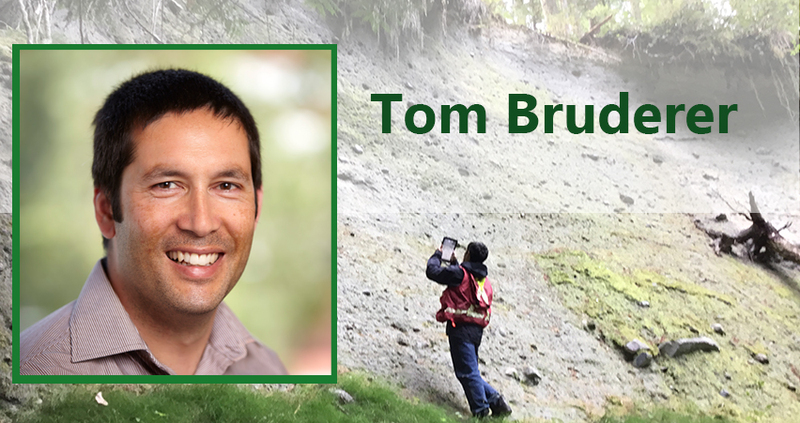 Tom has over 14 years of experience on the Coast as a forest engineer for major licensees. Prior to joining the Board, he worked as a terrain specialist consultant for two years and since 2016, worked on Board audits as a contractor. Tom lives in Comox on Vancouver Island. Astrid joined the Board staff in November in the Investigations program. 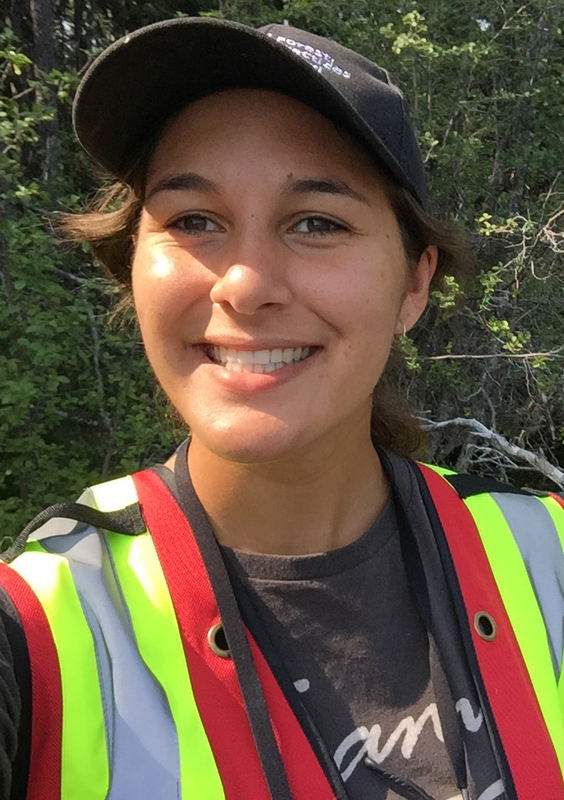 Astrid has a Bachelor of Science in Biology and a Master of Science in Forest-Wildlife from the University of British Columbia. She is a Registered Professional Biologist. Astrid has 25 years of experience as a consulting wildlife biologist, working for industry, government and other clients to integrate wildlife needs into forest and range management. She has extensive experience working with species at risk. She is currently leading a special investigation of Species at Risk under FRPA, focusing on Northern Goshawk. Astrid lives in Kamloops.